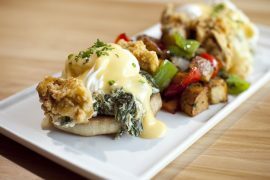 Sure, Atlanta is a great food city – you can get everything from a naked dog at the Varsity to a masterful four-course dinner at Bacchanalia. But there is one thing you can’t get that almost all other major cities have. Seems the city won’t allow people in Atlanta to enjoy the wonders of tacos, hot dogs, ice cream, Korean barbecue and plenty of other delicious, affordable food that people in Austin, Los Angeles, Portland and New York can enjoy every day. But now we have a committed group of folks who are determined to change that. 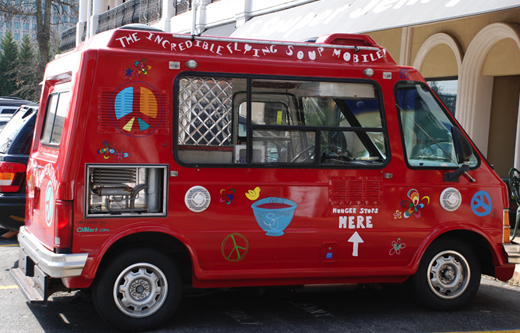 The Atlanta Street Food Coalition is campaigning to persuade lawmakers that we deserve to enjoy the opportunities for people to sell and buy food from trucks in Atlanta and surrounding areas. You can have a truck at a street festival or a catered event, and street carts are allowed more freedom, but locations are quite restricted. We attended a party Jenny Levison (yes, Souper Jenny!) hosted at her home last weekend, with food provided from food trucks and carts. Jenny has her own food truck, the Incredibly Flying Soup Mobile and hosted the Super Secret Underground Food Truck Extravaganza in the parking lot of Souper Jenny in April, serving up Nantucket lobster rolls, popsicles from the King of Pops and more. Between stuffing our faces with the delicious offerings and enjoying Jenny’s yummy frozen margaritas, we chatted with people about what it would mean for Atlanta to have this kind of street food. One woman spoke of a recent trip to Austin, where the trend has taken over. Some fans claim they get the best food in Austin out of one of the quickly multiplying carts. Haley Richardson, one of the founders of the Atlanta Street Food Coalition, was handing out delicious fresh spring rolls, filled with huge shrimp. She was also enthusiastically sharing her homemade ice cream sandwiches, housed in a food trike. My husband, who rapidly downed a lavender, mint, honey and vanilla sandwich made with sugar cookies, declared it the best ice cream sandwich he’d ever had. 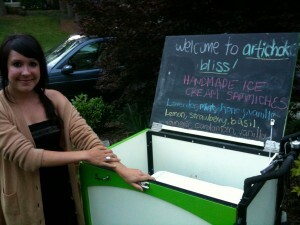 Haley’s business is Artichoke Bliss , and she also serves up sandwiches and various other goodies from her food trike. Much like the lively food cart scene in Los Angeles, where rabid fans make a game out of locating their favorites, the location of the Artichoke Bliss cart can be found by following them on Twitter. She told us that parking lot owners with vacant or little-used lots around town are endorsing the idea and would welcome the trucks. And there are plenty of vendors just waiting for the go-ahead. 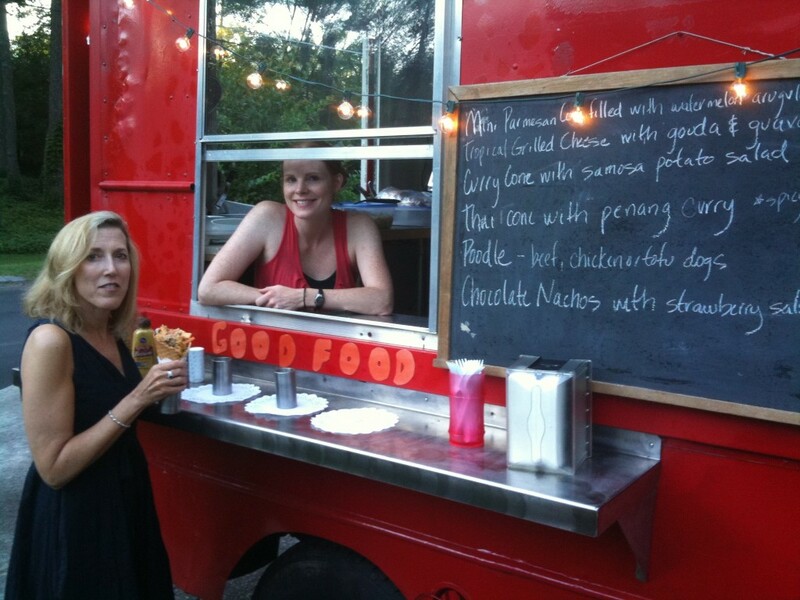 We tried just about every item from the Good Food truck, which you can also hire yourself for a catered party. A few items are uniquely served up in various flavors cones. We tried a Parmesan cone filled with watermelon arugula salad and a sesame ginger cone filled with penang curry vegetables and rice and ate every crumb. We had to try the Poodle, a hot dog made of beef, chicken or tofu, served with apple-maple slaw on a piece of French Toast. You are instructed to add mustard and syrup, a condiment I’d never thought to add to a hot dog. Sounds a bit strange, but the result is really yummy. At least from the small bite I got before Chris downed the rest. We were sadly too full to try the intriguing Chocolate Nachos, which are chocolate-covered corn chips, queso fresco and strawberry salsa. 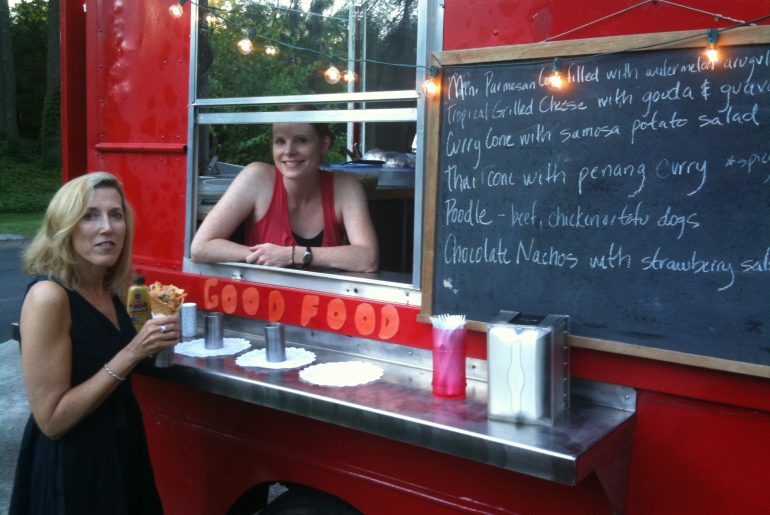 For now you can find the Good Food truck at various events. Follow them on Facebook to find their next location. 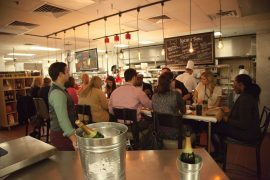 Atlanta Street Food has hosted several events to raise awareness, including two urban picnics at Sweet Auburn Curb Market. If you agree with me that Atlanta needs food carts that offer not only delicious food, but job opportunities for vendors and can help create a lively street scene, visit their website to sign the petition. Join their Facebook page to keep up to date and show your support. Or attend the next event to see exactly what we are all missing out on. What fun to see your blog about Atlanta! It makes me want to come back for another visit :~) You make me feel right at home here.